"It's like 100 yard sales in one location"
Before Inyo County existed there were towns along the Owens River populated by miners castoff from the declining California 49er Gold Rush. They were drawn to the Owens Valley River Valley, as it was called back then, by reports of riches coming from its eastern mountains. In the early 1860s miners, followed by merchants, coalesced into bustling communities along the eastern edge of the Owens River: Owensville, San Carlos, and Bend City. The tranquil streams of Bishop Creek Canyon belie the powerful economic impact they had on Nevada and California in the early 1900s. The canyon’s ideal combination of water and gravity produced hydro-electricity, creating great wealth for two states and two dominant industries. But practical use of electricity was in its infancy. Just a few decades earlier those who consumed it had to live close to power generators. For miners in the western deserts, that was a problem. A rare glimpse of life in the early 20th century. Authentic buildings, relocated here from their original sites throughout the Owens Valley, are filled with objects of antiquity. Visitors can see the actual tools used by dentists, physicians, newspaper publishers, gold miners, and blacksmiths, all displayed in historic buildings throughout the museum grounds. 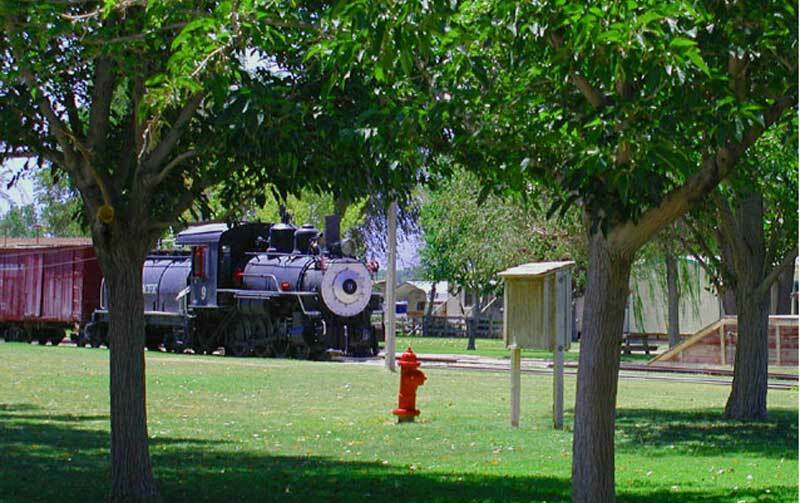 Travel back in time and experience the daily life of early homemakers with period furnishings displayed in a restored 1900 Ranch House, as well as the Railroad Agents House. Nearly 50 structures on eleven acres surround you with objects of pioneer life, including the original Slim Princess engine No. 9. The Laws Railroad Depot and the Slim Princess have changed little since the turn-of-the-century. Engine No. 9, with its train of boxcars and caboose, are surrounded by support structures including the oil & water tanks, original turntable, and Agents house. Train service began in 1883, and the Slim Princess steamed into Laws Depot for the last time 1960.The Southern Pacific Railroad station, rail yard, land, depot and other buildings, were donated to Inyo County and the City of Bishop by the Southern Pacific Railroad in 1960. The Bishop Museum and Historical Society was formed in 1964 to preserve what was left of the Laws Railroad Depot and Slim Princess. From that point on, people began donating historic items from wagons, farm equipment, and mining tools, to antiques, old photographs, and entire structures. Our aim is to discover, procure, and preserve whatever may relate to the natural, civic, literary and ecclesiastical history of our area, and to establish and maintain collections. The Southern Pacific Company gift deeded the original structures and land with the following statement: "In appreciation of the interest of Inyo County and the City of Bishop in preserving the memory of the Far West's last common carrier narrow gauge railroad, the Keeler Branch, Southern Pacific Company is pleased to donate steam locomotive No. 9 together with other rolling stock, and the Laws Station building and surrounding installations for safekeeping in behalf of generations to come."